Do not let others determine your definition of success! If you do, you will forever be behind the eight ball trying to attain someone else’s approval. Live your life, not theirs. You alone can determine what success means to you. And it is different for everyone. For some it is financial security – until the investments lose their value. Others define it through a relationship – until you are on the other side of a divorce. Some seek to be famous – until you can’t go outside and walk down the sidewalk without being mauled by people trying to get something from you. How do you define success? Hopefully your definition is more noble and long lasting, less superficial, and not easily destroyed. Earl Nightingale is often credited with defining success as, “the progressive realization of a worthy ideal.” That is a pretty good definition. I would go a step further and challenge you to attach your definition of success to your character and not anything material. Why? Because your character can never be taken away from you. Your character is something you carry with you and take into every situation. That means, regardless of circumstance, you have an opportunity to be successful. How? By continuing to grow and develop into the best version of you. Every circumstance and experience is an opportunity to learn, grow, overcome, sharpen, or otherwise improve your version of yourself. God never wastes an experience! Why are you doing what you are doing? Do you know the purpose behind your endeavors? What do you hope to accomplish in life? Are you creating a valuable legacy? Most of us desire to live lives that make a difference and have significance. We also all have goals but the nature of those goals varies greatly. Without a sense of purpose that naturally flows from a strong self-concept, self-awareness, and personal passion, your goals – if attained – will likely be short lived. Your perspective and how you see the world and your place in it has everything to do with everything you do. That is not an exaggeration – that’s reality. If you will begin by setting personal goals directly associated with who you want be become, goals you set for your actions will fall into place more readily. This is an organic approach consistent with your design. It is also an area over which you have much greater control. Your character and the influence it leaves behind is far more valuable and will last much longer than any business you ever build, fortune you amass, or fame you achieve. 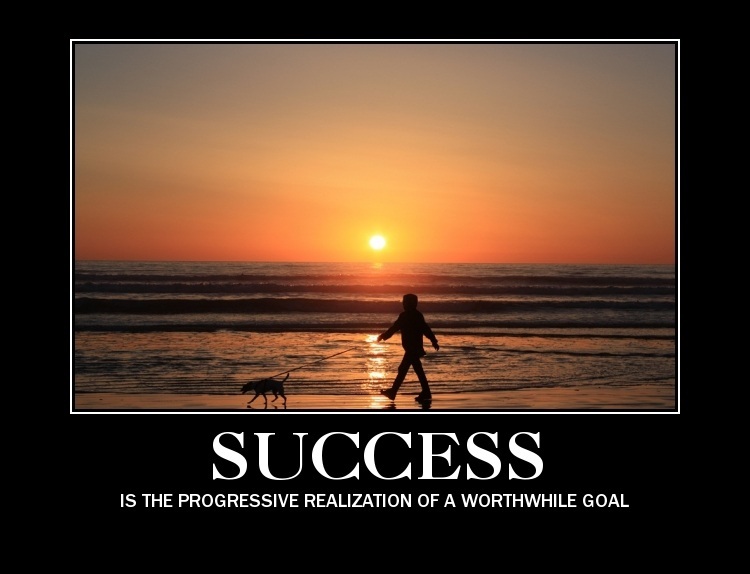 How will you know when you have achieved your goal and reached success? John Rockefeller was once asked, “How much money is enough?” His response, “Just a little bit more.” By that definition, success is never achieved. But maybe that is the way it should be. Consider your character for a moment. If your definition of success is directly related to your character development then chances are good you’ll never realize complete success. At least not on this side of eternity. You will always be striving toward becoming a better version of yourself. You will never be perfect but if you strive for improvement, you will never need to be perfect. Besides, thanks to the Cross, Jesus has has already perfected us in Himself. Our responsibility is simply to continue to grow, follow, and obey. Professionally speaking, growing your business and improving in your areas of responsibility and leadership are worthwhile goals. But if you can be more intentional about being someone others can come to know, like, and trust, you will be far more successful. Then you, as a person and not through position, will exercise more powerful and positive influence on the lives of others. They, in turn, will be uniquely challenged and inspired to follow your lead and seek to develop themselves as well. Thus, it is a win-win-win-win situation. You grow as a leader. They gain as followers. Your organization advances in ways not measurable on a spread sheet. And your customers and clients receive far more than any service or product can offer. What would it be like to have such a reputation in business? Where could such customer loyalty and referral lead? Who would not want to work for such an organization? And all because of the way you chose to define success. Do not ever let someone else impose their definition of success upon you or your life. Only One has the right to impose, and He never does. Your challenge now is to determine who you want to be and strive to become that person. You will be proud and glad you did. I promise. Notes: One way to realize your success is to know and live out your calling.